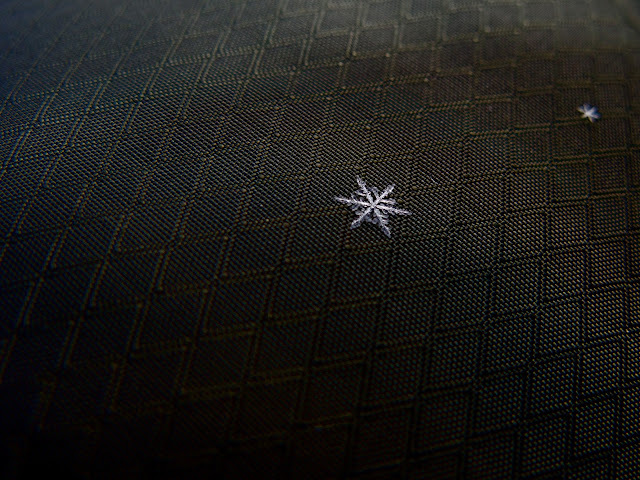 A couple years ago I took this picture of a snowflake that landed on my jacket while sledding in Waterton National Park with some friends. This video made me gain a lot of respect for snowflakes. I didn't know there had to be such specific circumstances for these things to be created. Pretty incredible. I like this new Christmas song. I think it is tastefully done and sounds great. Give it a whirl. I put a post up about these guys almost a year ago. You can check that out here. If you would like more info on the band feel free to check out their site by clicking here as well. So these two pics are a bit random. The top one is a recreation of a picture taken several years ago. It needed to be recreated for the sole purpose of a calendar given as a gift in a gift exchange. Damien (bottom with the big smile) had Phil and wanted to make it funny (he is way into jokes) so we helped out and got pretty darn close to the original. The second picture is one Willi took at her and Emily's Christmas party. From this angle it looks like there are only gals and me at this party. Pretty good. I had just opened up gift from Alexa. She nailed it perfectly with some specialty beverages and some popcorn. I've already had the orange cream soda and it was a winner. Merry Christmas. I don't really know anything about this musician but I dig this song. Merry Christmas. I've already posted this song but I don't care. I post this song every December. Sorry, kinda. This is my Brother and Sister singing their rendition of Do You Hear What I Hear. I really like it and I hope you do to. Send me an email (clarkcahoon@gmail[dot]com) if you want me to send you the MP3. Today was my little sister's Birthday. Way to go Michelle. She may just be a 22 year old but with her being the only married kid in the family she sure seems to be all grown up. It was fun spending part of the afternoon with her and my brother Bradley. Having family around will never get old... especially after living on an island for almost 7 years. PS If you ever get a chance to eat at Goumandise The Bakery, in Salt Lake City... I recommend getting an Almond Horn. Just do it. I have been meaning to post this since I first saw it several months ago. I like what this guy is doing. I'm pretty sure I could do it if I found the right piece of land just outside the border of Glacier National Park in Montana. Somewhere near Whitefish or something would be ideal. I'll keep you posted on that. Had a chance to visit The Cathedral of the Madeleine in downtown Salt Lake to see the Utah Children's Choir perform some Christmas music. There was a pretty big group of friends who showed up... probably around 30 of us. It was a great way to kick off the holidays. As a house we went and got a tree. In the first pic you can see Sam acting as protector of the tree after we finally all decided on the same one but had to get assistance since there was no price tag on it. Sam spotted it. She gets all the credit. The second picture is us showing off our fine prospect. We even got a deal and stayed within budget. Success. This was one of my favorite bands in high school. It'll never get old. Look into them. I like being able to walk through the door of my house and hear rock n roll music being played. This is what you get when you have three friends, from three different bands start randomly jamming in the dining room. Regal Beast, Jacket Weather, and Shark Speed. You take all of them together and come up with a totally new band called Beast Speed Weather. Saw these guys live and it blew my mind. They loop everything and build each song live before your eyes and ears. Nothing is pre recorded. Not even the drum beats. It was incredible. Get into these guys. This post is for my buddy Grant Monson. He went to Canada a couple of summers ago and decided that he couldn't ever live there because their ESPN sports center is different from the United States. I don't think he saw this guy when he was up there because I feel like the two of them have the same type of humor. These clips had me rolling. Some more than others but overall this guy is a crack up. I walked to the library in Salt Lake and got myself a card finally. I've been meaning to do it for quite some time now (I live two blocks south, so their is no excuse not to) but it feels good to have it in my possession. I snapped this blurry picture on my way home while still on the library grounds. PS The library in Salt Lake is one of the most unique and architecturally stunning buildings in Utah. Maybe instead of a blurry picture I'll post one of the building instead next time. WOW. These guys are genius.